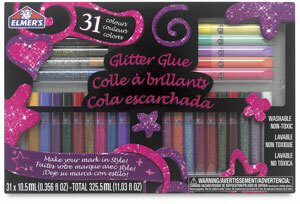 See art in a whole new dimension with Elmer's 3-D Washable Glitter Glue Pens. The glue dries with a raised, 3-D surface that makes artwork pop. It's the perfect accent for craft projects, posters, drawings, and more. The non-toxic, washable glue rinses from hands and most clothing with warm water. The ultimate pack for glitter glue lovers, this set includes 31 glue pens in a range of sparkling colors. ® Elmer's is a registered trademark.